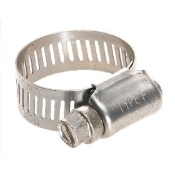 These 1/4" x 1/8" MPT barbed fuel fittings will fit our fuel pressure regulator and will fit the inlets to the Kadron Solex H40/44EIS carburetors. Sold in pairs. 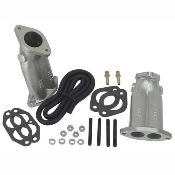 Adjustable Fuel Pressure Regulator Kit Aluminum Kadron Compatible Intake Manifolds EMPI "Generation 3"
Our Adjustable Fuel Pressure Regulator Kit is "Turn Key", just like our carbs. 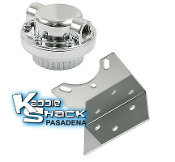 It comes with an adjustable regulator, a mounting bracket, two brass 1/4" inlet fittings, four USA-made stainless steel hose clamps, and two feet of USA-made fuel hose. Smart VW owners use cloth braided fuel, vacuum, and breather lines in their engine bay and under their fuel tank as VW designed. 5mm size came stock on carburetored VW engines. 7mm came on fuel injected motors, but can be used for more demanding... Smart VW owners use cloth braided fuel, vacuum, and breather lines in their engine bay and under their fuel tank as VW designed. 12mm and 14mm lines are often found in the fuel tank area to vent the tank, as well as on engines for oil breather and crankcase ventilation lines. Smart VW owners use cloth braided fuel, vacuum, and breather lines in their engine bay and under their fuel tank as VW designed. 12mm and 14mm lines are often found in the fuel tank area to vent the tank, as well as on engines for oil breather and crankcase ventilation lines. Fits fuel lines and up to 5/16" balance tubes. 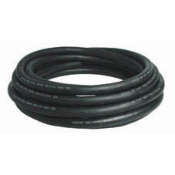 Fits 5/16" to 1/2" fuel hose. 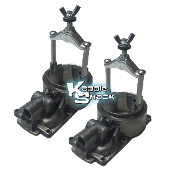 Mostly used for balance tubes between carburetors. These are super rare and highly sought after!